For most families, the kitchen is the heart of the home. It’s where you start and end your day, gather for meals and enjoy the fruits of your labor. Homestead’s builders have cooked up some beautifully designed kitchens with premium features and spacious, functional floor plans. So, whether you’re a professional chef or prefer takeout, you can have the kitchen of your dreams. 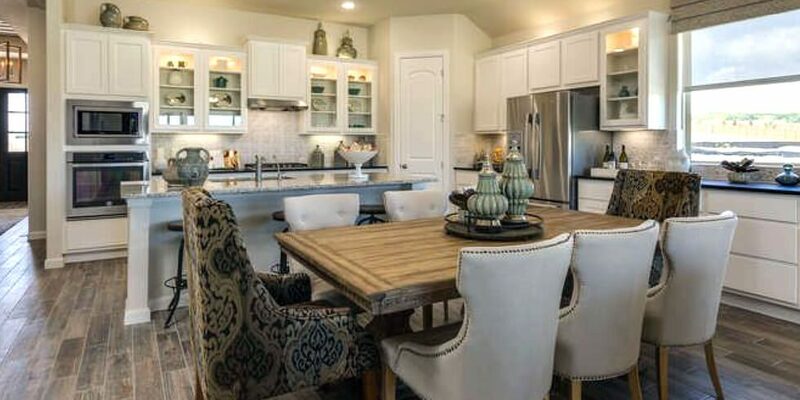 Kitchens by Scott Felder Homes are fit for royalty with many luxurious features already included. Crown molding, gorgeous and durable granite countertops, 42-inch cabinetry in your choice of colors, and stainless steel Whirlpool® appliances, including an ENERGY STAR® dishwasher are just of the few details that make these kitchens feel truly elegant. Kitchens by Pulte Homes were designed with the entertainer in mind. Spacious kitchens open up to adjacent dining and living rooms, so you can easily chat with your guests while making the finishing touches on dinner. And with a large center island and tons of counterspace to prep, you can easily cook a romantic dinner for a double date or feed the entire extended family. With CastleRock Communities, you’ll have plenty of options to customize your kitchen to best suit your needs. A large island gives you the extra counterspace so the kids can do their homework while you whip up dinner. Opt for a breakfast bar for a spot to quickly eat breakfast before running off to work. Or even add a window seat in the breakfast nook where you can cozy up to savor your latest creation. Ready to find your dream kitchen? Tour Homestead’s fully furnished model homes seven days a week, and join our Founders Club to be among the first to receive news and updates about this new community.